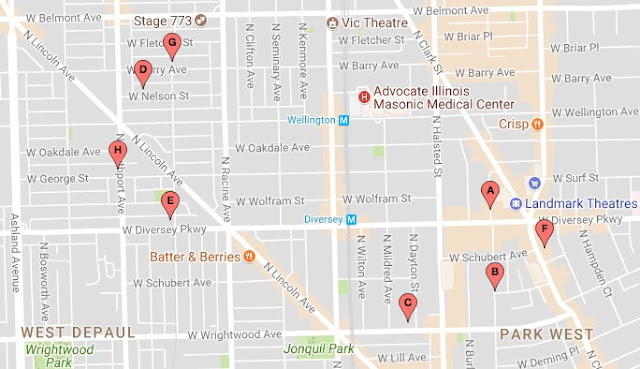 Approximate locations of eight robberies in south Lakeview and nearby Lincoln Park since January 1. Three more robberies have been reported in southern Lakeview and nearby Lincoln Park since midday Friday, continuing a trend of muggings in the area that began on New Year’s Day. Shortly after noon on Friday, a man armed with a gun entered Crossroads Trading at 2711 North Clark and announced a robbery. After collecting the store’s cash, the offender fled southbound on Clark. He was described as an older black male who stands about 5’11” tall and has a thin build. He was wearing a black jacket, a beany cap with a red ball, and is said to have “messed up teeth” and a scruffy beard. CWBChicago's exclusive reporting is funded 100% by our subscribers. Join now for less than $5 a month. The other two incidents involved robberies of people as they walked in nearby residential areas. At 7:15 p.m., a woman was jumped and robbed of her purse near Lakewood and Barry, police said. The offenders were last seen running eastbound on Barry and then south on Racine. Police described them as one man and one woman, both black, both about 5’10” tall and both wearing black coats with scarves. Around 3:30 on Saturday morning, a Lakeview man was jumped from behind, kicked, and robbed as he walked near the intersection of Southport and George. The victim was not able to offer a description of the two offenders because they approached him from the rear. He did say that one of the robbers held a knife to his back while the other took his wallet and messenger bag. Since January 1, at least eight robberies have been reported in south Lakeview and nearby Lincoln Park. Police have yet to issue a community alert about the pattern.